DotA 6.74c AI Fun v2.7 Map | More than 27 Fun Heroes! - Fixed some bugs, including Escutcheon recipe, bugs in Ramza abilities and Puff show less errors. - Ramza gains no job points near the Fountain. - Added up to 1'000'000 lives on DeathMatch mode (-DM). - Added new tavern with 5 new heroes. - Formless can copy abilities of new heroes. 1. Remade Tavern. The old version of remade heroes. 2. Extinct Tavern. 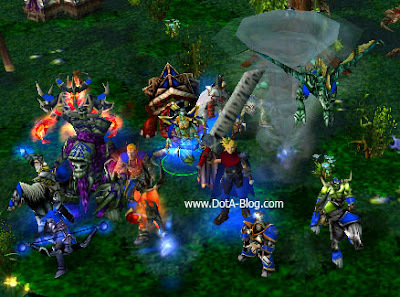 The heroes that no longer exist on the current DotA. 3. Concept Tavern. Fun heroes. 4. Tribute Tavern. Yet another fun heroes. 4. New Tavern. New Heroes Tavern. To activate the fun mode, just type -dm (to prevent bug) followed with -fun in the start of the game. i wish the insane AI are harder than the usual AI map. there's bug with Invoker's tornado, whoever affected by it won't come down ever..
what is cloud strife item build in ai fun? how do i download maps from here???? you need steam to download dota 2..
there no 6.74c fun ? Invoker : The Tornado, damage isn't increased when use Exort. But the fun items are crazy, i love it !! 8 Jul 2012) is FAKE. san pede mag DL ng latest na ai? I don't know if its a bug but for me its a bug when Puff Dragon uses his first skill and ultimate, he is dropping all his items..
DotA 6.75 Beta 5 Leaked! Roshan Place Changed and More! Hello..Can u add Terran Marine at a new maps?? Could I report a bug for the Fun version of DotA? Opposite units always be disabled when AI Invoker cast a tornado on them. It occurred nearly every time when Invoker use that spell. And players will find their heroes are disabled through all the battle and can do nothing about it. Only can watch the war until the end. Thanks to information where i get the dota maps..
Could I report a bug for the Fun version of DotA? 6.74 ai fun map is fake!!!!! to the Fact Sheet. According to reports, loan amounts usually range from $100-$500.